Katherine S. White is best known as the fiction editor at the New Yorker who discovered the writings of Vladimir Nabokov (novelist and poet), John Updike (American novelist, poet, short story writer, art critic, and literary critic), James Thurber (American Cartoonistauthor, humorist, journalist, playwright, and celebrated wit), Marianne Moore (American Modernist poet, critic, translator, and editor),) and E.B. White. She is also known as the second wife of E.B. White (Charlotte’s Web, Stuart Little, Trumpet of the Swan, Here is New York). After her retirement from the New Yorker, she and her husband lived full time in their home in Maine. It was there that she wrote a series of essays on gardening, through the review of garden catalogues or as she states “Seedsman and Nurserymen”. The New Yorker published her first article in March 1958. An article written by such an esteemed editor certainly grabbed the attention of the ‘Seedsmen and Nurserymen’. Katherine had very defined preferences for her plants in her garden. She did not like the trend to produce larger and larger blossoms on annuals. She also disliked flowers that were hybridized to produce doubles; she preferred the simple, single layer of petals on her flowers, better for the pollinators. She also disliked the use of ‘sprays’ in the garden, again ahead of her time in her dislike of the use of pesticides. She wrote thirteen articles in total, on the topics including the history and literature of gardens, flower arranging, herbalists, and the newest developments in gardening at that time. This book, a collection of her garden articles and journals, was first published after her death by her husband in 1979, and republished in 2015. Horticulture magazine wrote, "Although she never claimed to be more than an amateur, her pieces, especially her famous surveys of garden catalogs, are remarkable for their fierce intelligence and crisp prose." 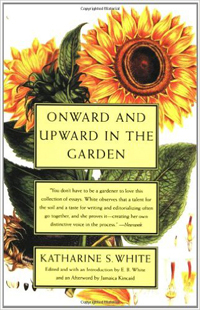 Her writing has a deep appreciation for gardening and nature, with her personal, definitive aesthetic shining through. This was thoroughly enjoyable and inspiring read of her dreams for gardens.